If anyone is experimenting with a rocket stove and expecting to hear the rocket sound so they know they have done it right. The rocket sound might not be the best indicator of success. No smoke is the best indicator. I have found that I can get a blue flame in my stoves that I have converted to rocket type. A slow steady blue (very hot) flame. If there was a rocket sound in my stoves there would be to much heat going up the chimney. chimpac, your rocket stove reminds me of the Jetstream furnace. It was an amazing piece of technology that went into limited production in the 80s. I saw one in action, they were amazing but expensive at the time. The developers ran out of funds. If I remember, they were made in Nova Scotia. If God had meant birds to fly, He would've given them engines. Chimpac, why not post some photos of your new stoves? I'm sure others are interested (I am!). Ditto, pics would be cool! The stove chimney port is close to the bottom of the stove body. I do not have a cone shaped bottom on this stove, only many holes punched in the floor of the back portion of the combustion chamber. With a cone shaped bottom the closed in feed tube could operate more vertical. The flat bottom gives me all the draft under the fire I need to keep a hot fire with very little ash. I prefer to camp with a cook stove size stove and a sit on the ground height shelter even in the coldest weather. I get enough heat from the cook stove to dry out my sox and other stuff. This stove uses a #10 can which is near 6", a 5" can is all I really need. In summer it is the 5" only 3" high. I can modify the summer 5" to add a longer riser pipe inside and another whole can fitting upside down on the top for winter. Those that go with a hot tent can nearly double the heat of their stove if they use rocket stove ideas like a hot riser pipe up into a barrel or can above their stove. Then they will have a cooler chimney and forget the spark arrestor. I'm starting to like the idea.... 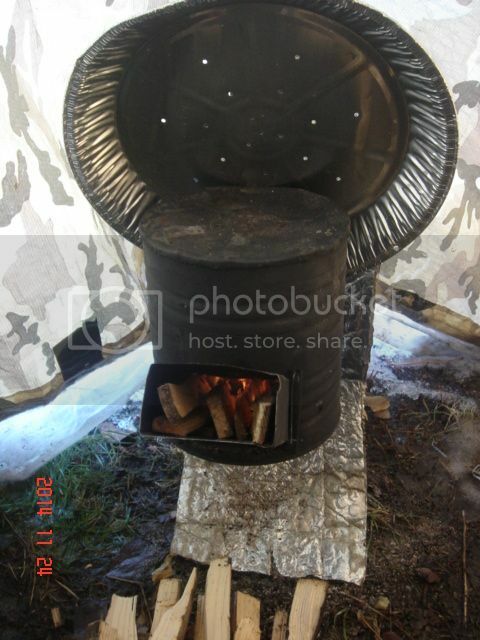 I have a friend that experimented a bit with rocket stove, but not for camping, and the only concern/question I have is how you regulate the burning? If I want a long slow burn during the night, or a hot warming the tent asap type burn, or a medium, it is comfortable to sit in the tent type burn. On a regular stove, we can play with damper, air intake or wood... How can some one achieve that with a rocket stove? Thank you, this is fun!! You can put a damper and air intake controls on a rocket stove and you need the controls depending on the size of the combustion chamber. When I first started looking at rocket stoves I only saw those with a small combustion chamber that could burn with full draft and not melt down. I am seeing some now with larger chambers built by people that want a longer burn. A rocket stove chimney might quit drawing if a smoky, dampered down fire was burned when trying for an all night burn. If you want the heat on while you are in the sleeping bag just stick a propane tiger torch in the stove for the night. I f you use a thermarest chair or a sleep pad doubled and tied to your back it is comfortable sitting on the ground. My pie plate reflector looks like it has soot on it. I never saw that when I took the picture. I will check in the morning and maybe find how it got there. Kinguq you can try a closed in feed tube which should work well with your cone bottom. The bottom of your vertical feed door will have to be trimmed to fit tight to the new tube. I have a theory that a feed tube that is vertical or somewhat vertical has some chimney effect that counter acts the inward draw from chimney and this might increase air pressure coming in the bottom grate. So if the tube is to long or big there will be more tendency to smoke back. I have a cover for my tube and use it if I get some smoke back but I have not had to use it much. You can see that the top of the feed tube of the Jet stream furnace above is sealed and the draft air comes in lower. Our family owned a Booker coal stove that had much the same design. The hot riser pipe in a barrel is not used with the Booker or the Jet stream. My pie plate reflector is shinny clean no soot, must be a shadow, should have used the flash. I do love the feed tube, I have full view of the flames at all times. Temperature is regulated by the amount and size of the wood shoved in. It can swallow a lot of wood and get very hot if I push it. I have never had a stove burn as clean. kinguq, if you look close you can see that the tube is supported by wire. The latch shows on the right side. The angle can be changed and the wire keeps the top side of the tube tight against the stove. If I understand what I am looking at, there must be a smaller can inside the visible one, open at the top, that acts as the burn chamber and riser tube. A smoke channel exits at the back near the bottom of the larger can. Have I got that right? It would be neat to see a few pictures of how you assemble this stove. Thanks for the advice about the feed tube. I am still getting to know my stove. 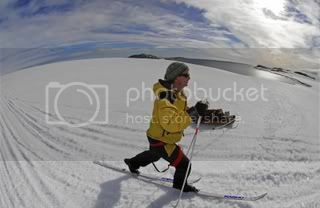 I was hoping to go on a trip this week but then all the beautiful snow melted over the weekend. Maybe next week. I painted the stove and will do an outdoor firing this week to de-fume it. So far I have not had any trouble with smoke coming out the feed door, except maybe a bit before the stove gets going properly. But that doesn't take long. It seems to me it would be easy to make the feed trough into a tube using alu foil or pie plate material, if that becomes necessary. I'll get a couple of camping nights under my belt before I consider any modifications. If your rocket burns more efficiently than the version I have, it must be very efficient indeed! The can (combustion chamber) inside is only slightly higher than where the tube enters the stove. The riser pipe takes the smoke to about 3/4" from the top cover. I think the smaller combustion chamber develops higher temperature and therefore a more complete burn. The difference between how much wood you burn to stay warm or cook a meal is not to different than my new stove. We can not get to excited about how much more time it takes you to gather wood for the day than the time it takes me. My new one is simpler to make and I do like seeing more of the fire. I may get more heat out of wood burned because the smoke has to give up some heat and get cool enough to get out the bottom of the can before it goes up the chimney. The hot riser pipe gives the needed push to the smoke to force it out the bottom of the can. The chimney of course has some draw so saying that the riser pipe forces out the smoke is not quite right. Maybe it is more accurate to say that the riser pipe gives draft to the fire. Interesting, I am starting to visualize it. Assuming the big can is about 6 inches wide, how wide is the combustion chamber can? And what is the diameter of the riser tube? where back in 2010 I tried to make a rocket-ish stove. I think with some more work it could have been pretty good, but it was such a frankenstein, do to my sheetmetal skills (or lack thereof) that I gave up, but I think the design has merit. I'd be surprised if it's much different than chimpac's, if I understand his explanation correctly,except his is actually practical/usable. In fact I'd really like to know more about his stove. Red, tried your link and it says I don't have permission to access that page. I am a member at hammock forums, but even after logging in, it wouldn't let me use the link.